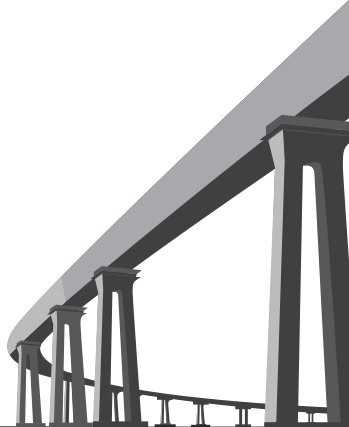 You’re also aware how difficult conforming to those national bridge inspection standards can be. As a Consultant, a Bridge Inspector, a Bridge Manager, or a County Engineer, you know the gravity of your responsibility. You know a bridge inspection report is a legal document, and in the event of a structural failure, even the punctuation on your reports will be subject to scrutiny. You dot your i’s. You cross your t’s. You use precise, quantitative descriptions. For most of the structures for which you’re responsible, you’re very comfortable with your inspection procedures and results. But there’s that one bridge, probably load-rated, and maybe downgraded several times, that has been the topic of a lot of conversations within your organization. “Structurally deficient” doesn’t tell half the story. What if the bridge fails and it’s determined one of the elements you were unable to inspect was the cause of the failure? These are the tough ones that can keep a Bridge Inspector or Bridge Manager awake at night. 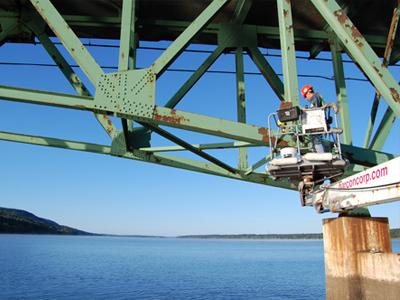 Since 1988, Harcon has built its reputation as the company to call for the toughest bridge inspections. If you have a structure anywhere in the contiguous United States that’s been an ongoing concern, and you’re not comfortable with the level of access you’re getting, call us. We won’t guarantee we can solve all your access problems. But we’ve solved a bunch of them. You’ll make our job easier by giving us as much information about your bridge inspections as you can including: feature carried/crossed, photos of structure and terrain, plans, streambed profile, freeboard dimension, and GPS coordinates. We’ll do a site visit, if necessary. Then we’ll make a recommendation. No charge. And you can go back to getting a normal night’s sleep, knowing you’ve done all you can to conform to the National Bridge Inspection Standards with confidence. Contact Harcon Corporation today to get started. * Our equipment is pictured in the National Highway Institute’s Bridge Inspector’s Reference Manual, published by the U.S. Department of Transportation. Click here and see our Bridge Trackers in Figures 2.5.18 and 2.5.19. We’re pretty proud of that. We didn’t write the book on bridge Inspection, but we’re in it!